New York Times bestselling author Charles Graeber details the astonishing scientific discovery of the code to unleashing the human immune system to fight -- and possibly even cure -- cancer, in this "captivating and heartbreaking" (The Wall Street Journal) book, featuring interviews with 2018 Nobel Prize in Medicine award-winners James P. Allison and Tasuku Honjo. As it turns out, the answer to that question can be traced to a series of tricks that cancer has developed to turn off normal immune responses-tricks that scientists have only recently discovered and learned to defeat. The result is what many are calling cancer's "penicillin moment," a revolutionary discovery in our understanding of cancer and how to beat it. 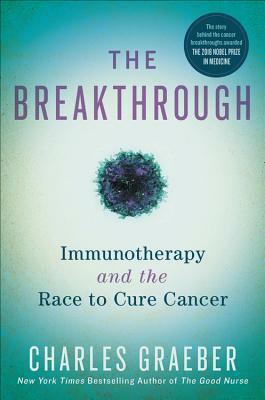 In THE BREAKTHROUGH, New York Times bestselling author of The Good Nurse Charles Graeber guides readers through the revolutionary scientific research bringing immunotherapy out of the realm of the miraculous and into the forefront of twenty-first-century medical science. As advances in the fields of cancer research and the human immune system continue to fuel a therapeutic arms race among biotech and pharmaceutical research centers around the world, the next step-harnessing the wealth of new information to create modern and more effective patient therapies-is unfolding at an unprecedented pace, rapidly redefining our relationship with this all-too-human disease. Charles Graeber is the Edgar Award-nominated, New York Times bestselling author of The Good Nurse. Winner of the Overseas Press Club award for outstanding international journalism, he has contributed to numerous publications, including Wired, GQ, The New Yorker, New York Magazine, Bloomberg Businessweek, and The New York Times. His work has been included in The Best American Science Writing, The Best American Crime Writing, and other anthologies. Born in Iowa, he's now based out of Brooklyn, NY. "Graeber does it again. He takes a complex topic -- this time advances in cancer treatment -- and weaves an engaging narrative that engages you to the end. With cancer as a leading cause of illness and death, this book is a timely and important account of the challenges and possibilities for new horizons in cancer treatment." "Rare and thrilling...a hopeful, even inspiring, book about cancer."